The Holy Bodies together with the relics of the saints were brought to the Vodnjan parish church by the academic painter Gaetano Gresler on 23 June 1818. 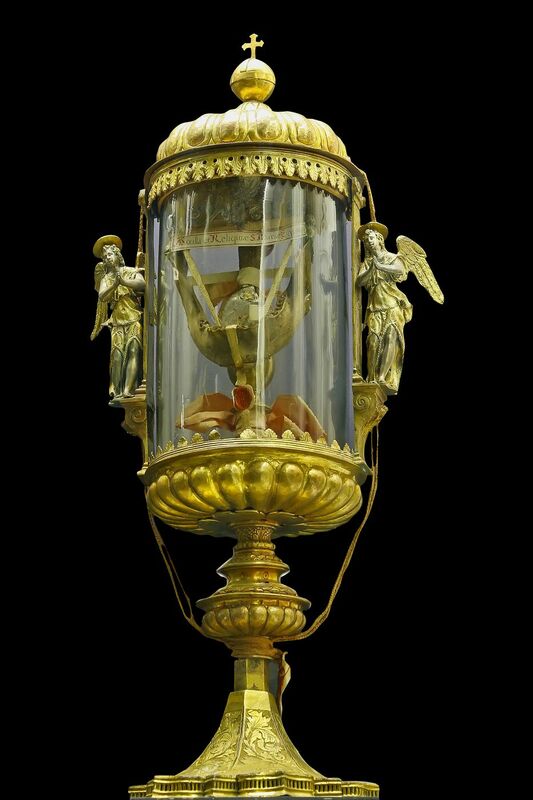 After a conflict with the church and the community because of unfulfilled commitments, he stole the reliquary containing the precious Blood of Christ from the tabernacle and disappeared without a trace. 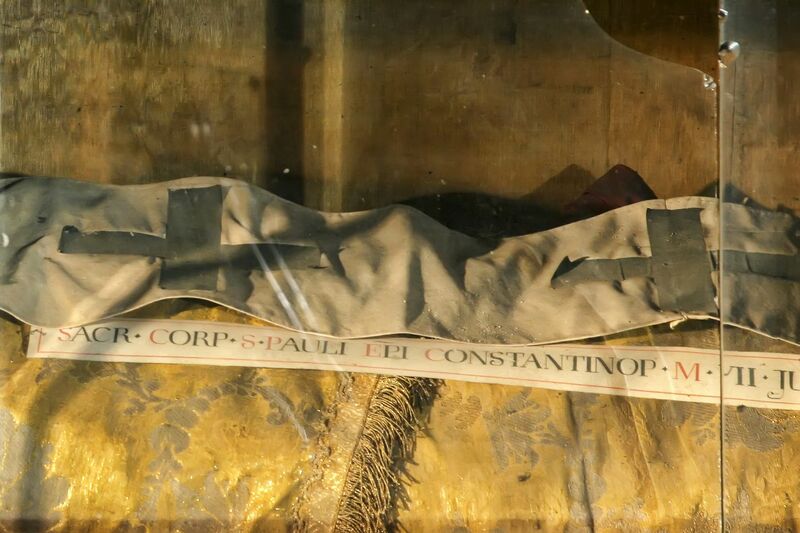 It is thanks to him that the incorrupted Bodies of the following are kept in Vodnjan: the Archbishop Saint Leon Bembo (+1188), the priest Saint John Olini (+1300), the Benedictine abbess Saint Nikoloza Bursa (+1512), and other smaller incorrupted pieces of the officer Saint Sebastian (+282), the virgin and martyr Saint Barbara (+288), the penitent Saint Mary of Egypt (+522) and the right forefinger of the Patriarch of Constantinople Saint Eutych (+582). 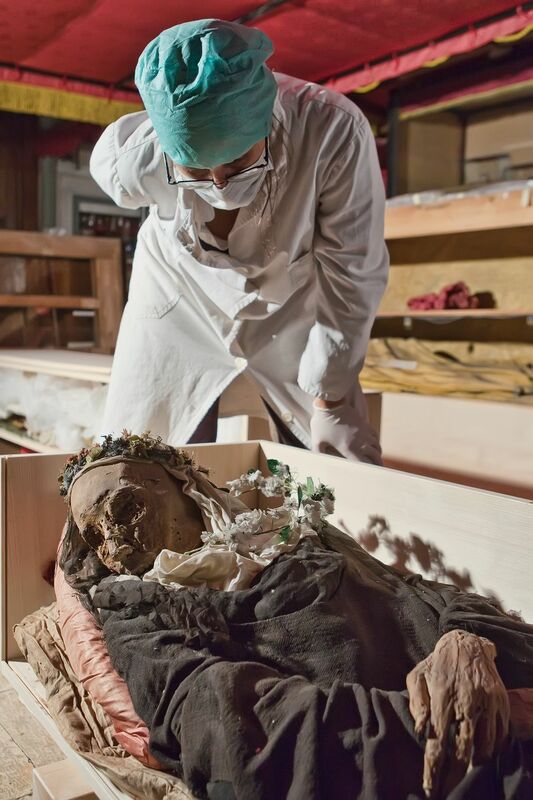 The Bodies, as well as the remains are not embalmed and as such represent an inexplicable phenomenon of self-preservation. 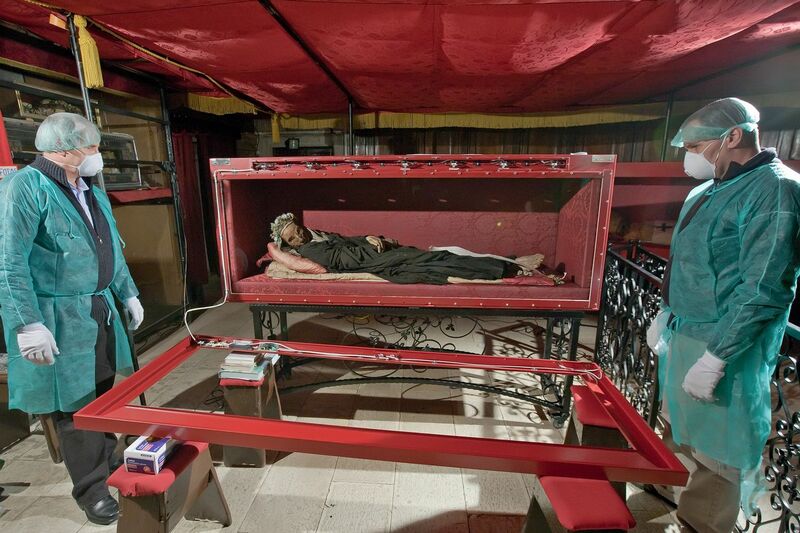 At a CT scan in 2009, it was established that the Bodies of Saint John Olini and Saint Nikoloza were preserved containing all of their internal organs, which is considered an unique worldly specimen of self-preservation by the anthropologist and archaeologist Dr. Matteo Borrini from Florence. To date, 280 000 visitors, of which about 180,000 school children, have passed through here. Her life was described by the doctor of theology, the priest Simone Antonio Rotta, the parish priest of the Church of Samuel in Venice. 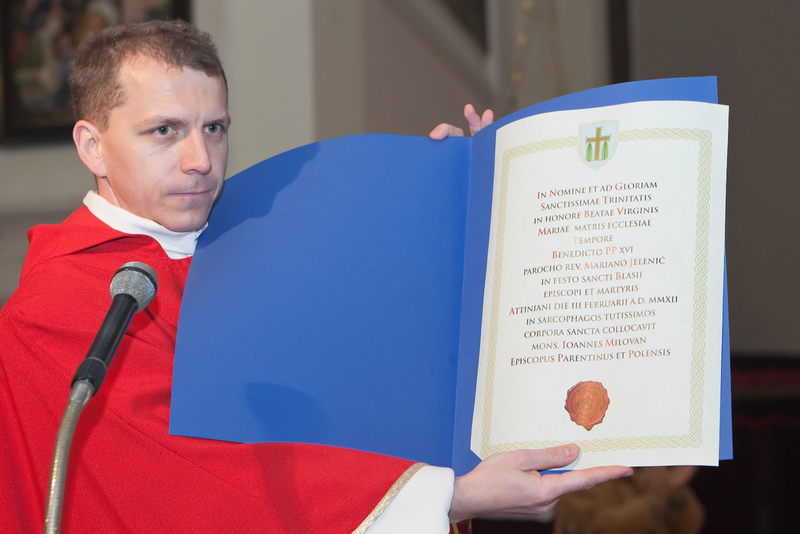 The manuscript is held in the Archives of the Parish office in Vodnjan. 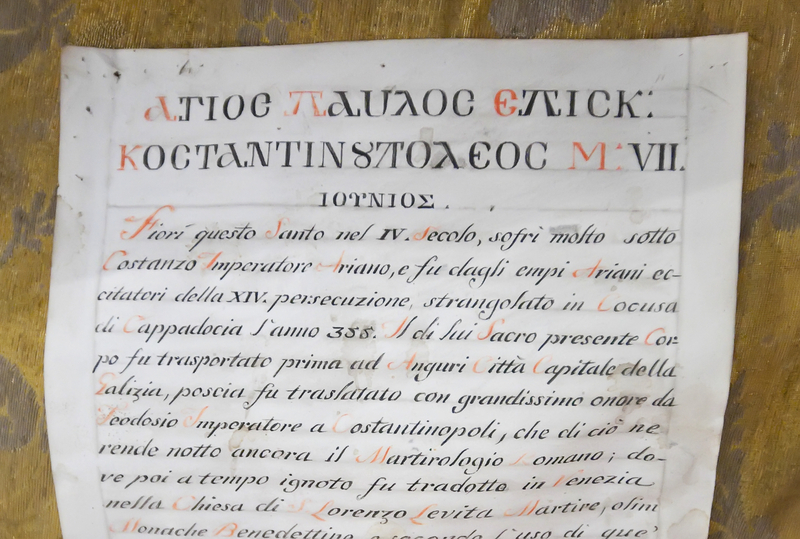 The aforementioned swears to have gathered the information from the Chronicle of the convent of the sisters of Saint Mary the Humble in Saint Servolo (Santa Maria dell’Umiltà a San Servolo), and from the manuscripts from the Convent of Saint Anne. Nikoloza was born in Kopar in 1437, in a family originating from Modon in Morea. As a young girl, Nikoloza felt God’s call towards monastic life which, as history writes, she answered. She left Kopar for the Benedictine convent of Saint Servolo in Venice where she took her vows in 1465. She was a virtuous woman, excellent in all, especially in praying the Liturgy of Hours. Holy in all her works, she soon caught the attention of her superiors. She was chosen an abbess on 3 October 1502. The community of the Sisters of poor hermits was formed alongside the church of Saint John Lateran and was still missing an abbess of proven virtues. Trevisan, the director of the convent of the Sisters of Saint Zacharias, was enquiring with his cousin, Sister Arsenia, at the convent of Saint Servolo in Venice, about where to find such a nun. Without hesitation she recommended Nikoloza. With other benefactors of the convent he succeeded in promoting Nikoloza to the convent of Saint John Lateran. The Venetian patriarch Monsignor Antonio Suriani personally delivered his decision about her appointment on 5 October 1505. 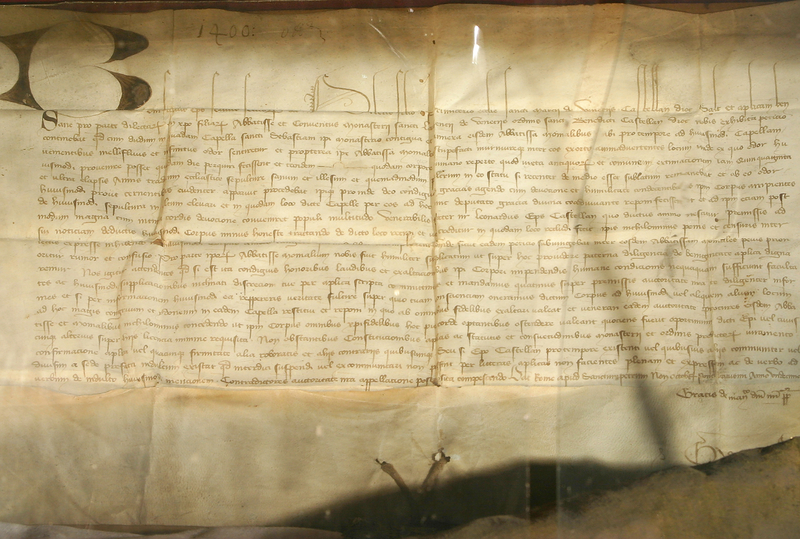 The decree that was co-signed by the Chancellor Francesco Moriando is to the present day kept alongside her body. The convent was soon afterwards known for the holiness of Nikoloza and her nuns. The same Simon Rotta stated how noble Venetian families gladly sent their daughters to this convent to be educated and nurtured. However, attracted by the holiness of Nikoloza, they did not go out but preferred to stay in the convent. Nikoloza successfully comforted the sorrowful. So too the Queen of Cyprus, Catarina Cornaro, who was mourning for the loss of her kingdom. Unusual events occurred in the convent. Often without anything, in Providence, she invited the sisters to pray before meals. The sisters would stand in wonder, why go to the table when there is nothing to eat. While they prayed, someone would knock on the door, and leave everything they need for a meal. Many a time they would find Sister Nikoloza in ecstasy, in levitation observing the spiritual world. She was given the gift of seeing the day of her death. The sister did not believe her but she died as she previously described to them on 23 April 1512. The sisters noted in the Chronicle that she became increasingly happy as her approached her death. Nikoloza was buried in the convent tombs of Saint John Lateran. In 1526, the convent of Saint John Lateran was joined to the convent of Saint Anne in Kaštel. The sisters then wanted to take the Body of the holy abbess with them and found her body incorrupted even after forty years. 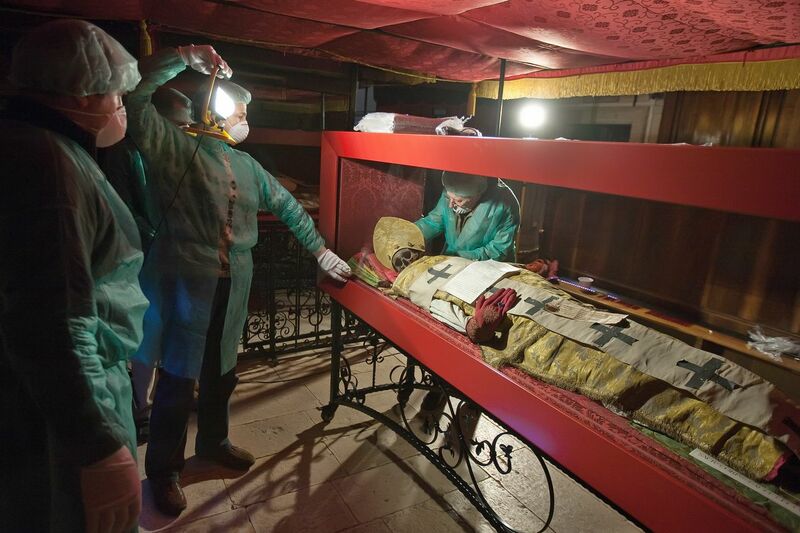 The reaction of the people who came in masses to see the miracle was expected so the Patriarch Monsignor Girolamo Querini ordered her Body to be exhibited for four days in the left chapel of the Saint Peter’s Cathedral in Kaštel. The fourth day they found a wondrous fragrance in the cathedral. 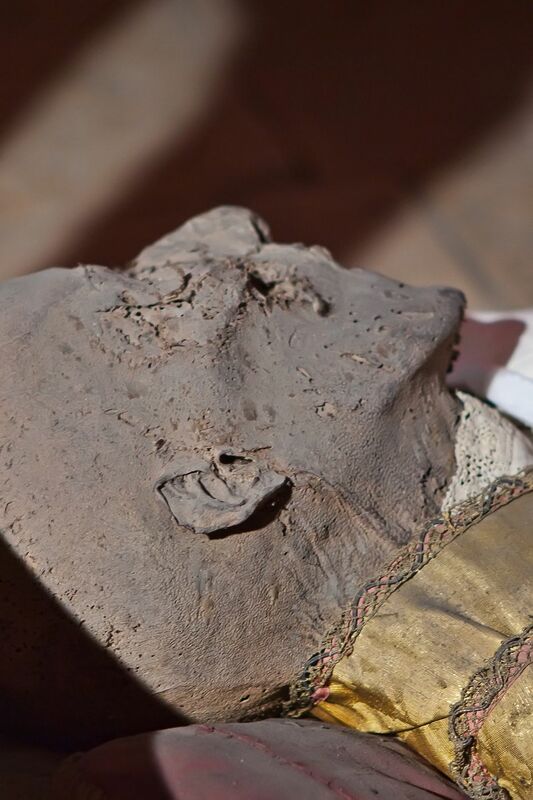 Then the Body was returned to the convent and put into a stone sarcophagus alongside which many left votive gifts. 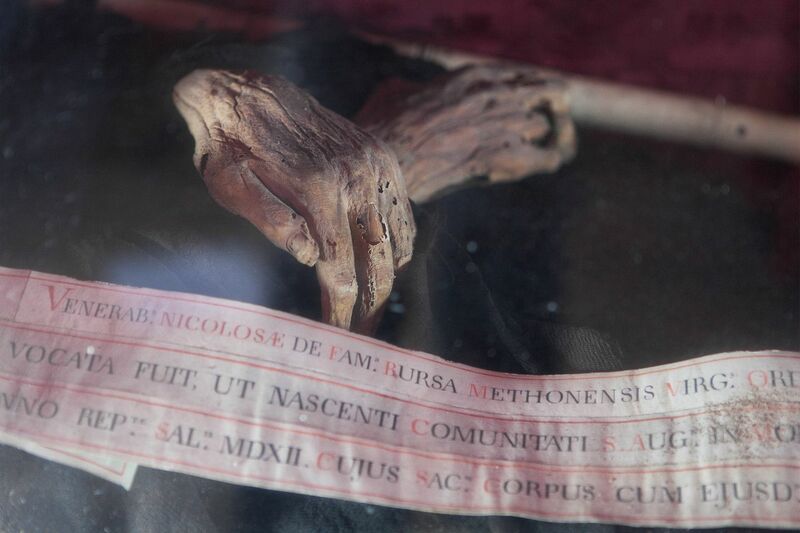 With the permission of the Patriarch Monsignor Badoer, during the time of the abbess Maria Regina Rossi, in the presence of the confessor Bartolomeo Zenadio, the sarcophagus was opened in 1689 and once again the Body of the abbess Nikoloza was found incorrupted. 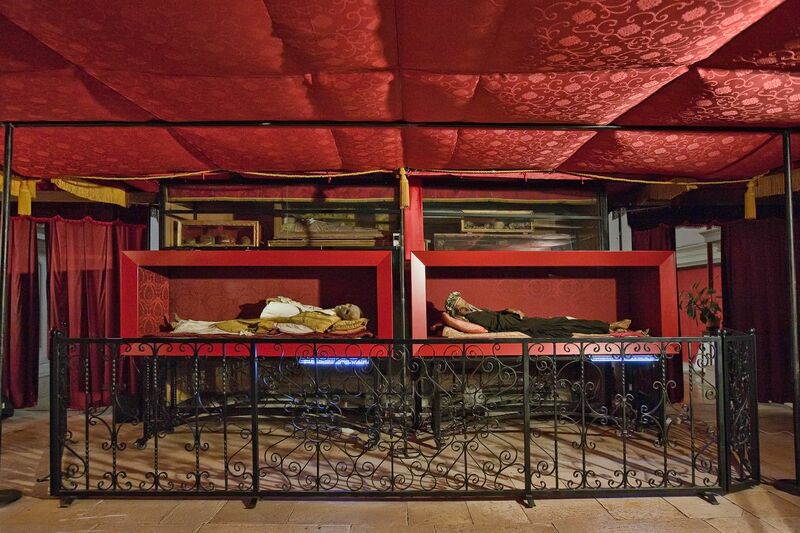 By the decision of the Patriarch Monsignor Badoer, the sarcophagus was opened again on 29 September 1700 and exhibited for three days, after which it was in permanent exhibition in the Oratory of the convent where it could be seen through a window. Similar things happened during the openings in 1750 and 1759, during the visits of the abbot Giorgio Fioravante and Giuseppe Matalina. At the decree of Napoleon about the abolition of convents on 27 November 1806, the Body was moved to the convent of Saint Lawrence. 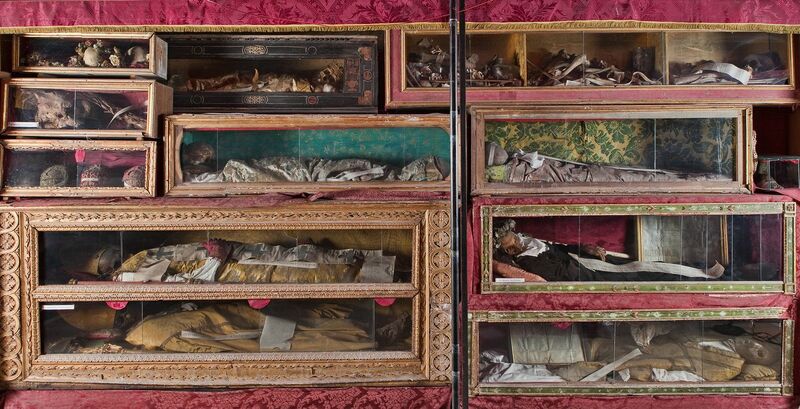 Then in 1810, when the decree of the abolition of abbesses was announced, Adelaide Zorzi gave the Body with the manuscripts to the painter Gaetano Grezler who, with other collected relics, moved it to the palace Lezze di Misericordia of the Countess Camille Martinelli, from where he departed with the precious cargo and arrived to Vodnjan on June 23 1818. In the manuscripts we find 45 signed testimonies of the graces and healings made through the intercession of Saint Nikoloza. There are many pilgrims who in Vodnjan specifically pray for her intercession and testify about healings. Nikoloza died 122 years before the decree of Pope Urban VIII. Her exhibition and reverence is without end, so according to this she can be considered a saint. 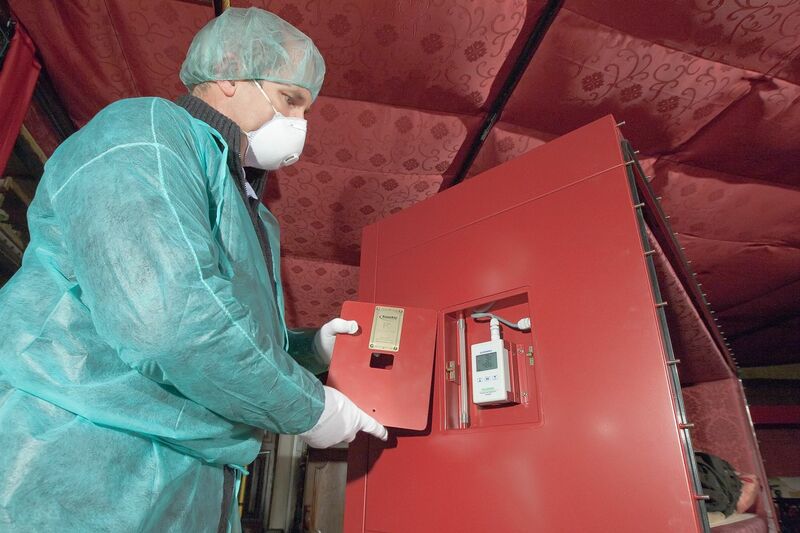 At a CT scan in Split on 28 November 2009, it was established that the Body had preserved all of its internal organs. Her Feast day is on her birthday for eternity on April 23rd. The Istrian Church is repaying the Saint because her reverence is being renewed after 192 years of anonymous stay in Vodnjan. At the beginning of the 13th century there were great fires in Venice. On the eve of the Feast day of Saint Peter and Saint Paul a major earthquake happened. The German Emperor was attacking the Pope. Conflicts between the so called Guelfo and Gibelini waged war and devastated many regions. During those years, in 1215, a son named John was born into the Olini family in Venice where he was educated in the faith. The boy, from an early age, proved to be good-natured and studied the Holy Scripture. Many plagues harried in Venice during the service of Father John Olini. During just one outburst of infection, a tenth of the inhabitants died. Confession and the Eucharist were given to those who were dying. He dared to visit the dying where no one else would go due to fear of their own death. As nothing happened to him, he was pronounced a “living saint”, a “walking miracle”. He died an old man of 85 in the year 1300. 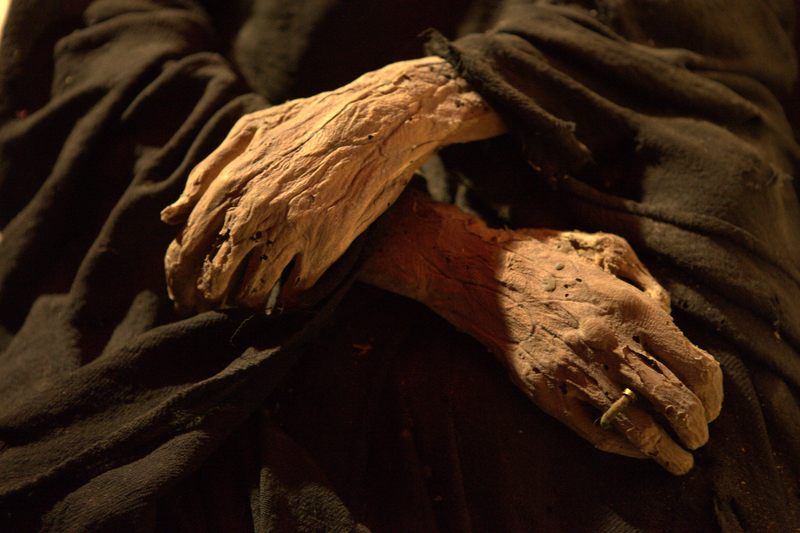 His body was laid down in a stone sarcophagus in the church of Saint Sebastian, the patron saint against the plague. On the occasion of a funeral in 1393, restless children knocked over the sarcophagus where an incorrupted body was found in priestly clothing. The Saint appeared during the night to Sister Nikoloza Gradenigo and ordered that the name John be inscribed on the body. And it became clear whose body this was. 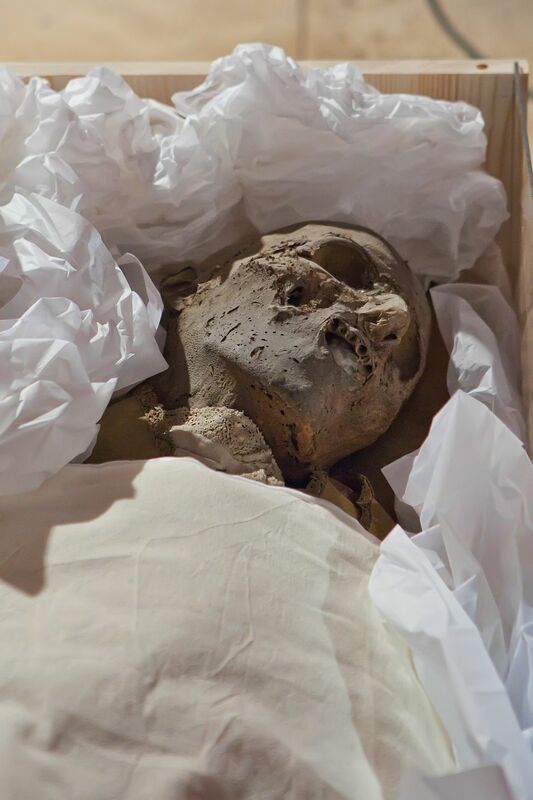 He was found with raised arms in the sarcophagus which added to the mystery of incorruptibility. Pilgrimages to the incorrupted Body then began which were opposed by Bishop Monsignor Leonardo Delfin. The convent turned to the Pope Bonifacio IX. who, with the Bull on 7 October, ordered the church judge Francesco Bembo to oversee the case. The following year he became a bishop in Venice and approved the veneration of Saint John. His veneration was also approved in 1622 by the Patriarch Giovanni Tiepolo, while in 1644 the patriarch Francesco Morosini ordered the sarcophagus to be built into the altar of Saint Lawrence. The altar of Saint John has become a target of pilgrims. “Saint John, let no evil come to me, as none came to you” was the prayer of pilgrims. In 1795, after a mass served at his altar and in his honour, a girl Antonia Maria Teresa Suman was miraculously healed. As the mass was ending, she said: “Grace has been conferred” and in three days she was completely healthy. Saint John Olini is counted among the 27 saints of Venice. He was proclaimed the patron saint of Venetian parish priests. Saint John Olini is, therefore, a bishop saint, without a special form or his own mass in the Missal. At a CT scan in Split on 28 November 2009, all his internal were registered in his incorrupted Body. His feast day is on 10 August. His life is described in the book “Quaranta immagini dei Santi e dei Beati viniziani più noti pubblicati da Daniele Contarini ed illustrati dal viniziano sacerdote Gianmaria Dezan, Venezia 1832.” Leon was born in Venice at end of the 11th or beginning of the 12th century. When Pope Eugenius III convened the Third Crusader’s army in 1147, Leon left for Syria with the Venetian fleet under the command of the Doge Domenico Michieli. In Modon they came upon an empty seat of the archbishop and found in Leon, a model of faith and piety, the solution. Leon was made a bishop. He was not bishop for long as the Emperor Emanuel Kommen took control over Venetian territories in Morea by fraud in 1158 and imprisoned Leon. Only by a miracle was he saved and returned to Venice. There, as a stranger, he offered to serve the sisters of the Convent of Saint Lawrence, performing everyday jobs, being especially sensitive to the poor. They often found him in the garden nook in fervent prayer. There he was found dead in 1187. And only then did they find out his identity. 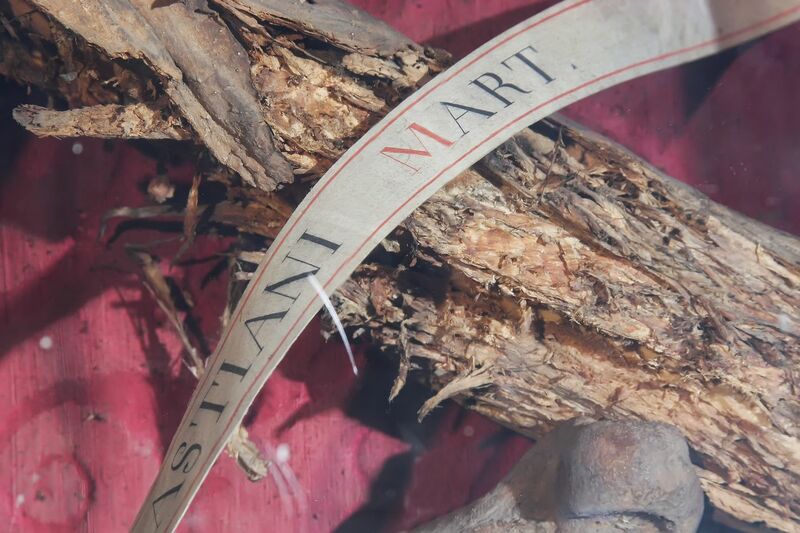 The aforementioned author states the bishop of Venice Giovanni Polani ordered his body be put in a marble sarcophagus in the underpass of the Convent of Saint Sebastian until, due to miracles, the process of sanctification was finished. Because of great plagues, he was forgotten in Venice. However, as a wreath of stars appeared in the heavens and a glowing arm pointed to the sarcophagus with his body in 1207, an abbess had the sarcophagus opened and found an incorrupted and supple body next to which miracles happened. 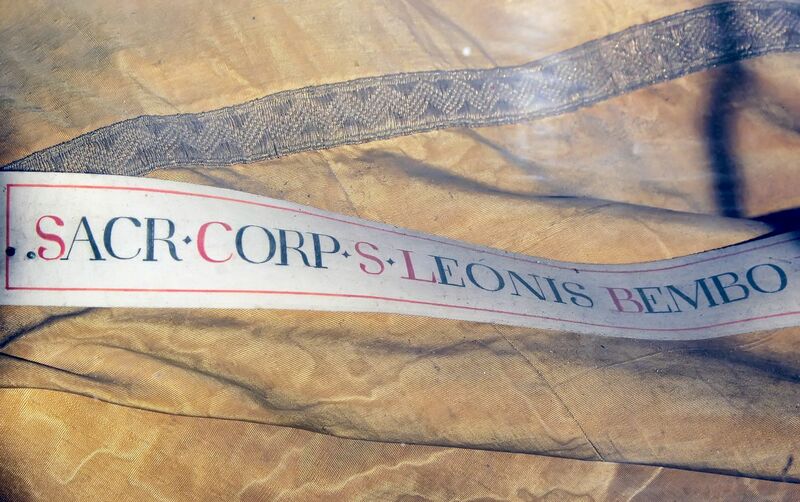 In the restored church, a coffin was opened that had written on it “corpo del beato Paolo” but the bishop Feltre mons Giovani Paolo Samo who at the time held the patriarchy of Venice, ordered that inscription over the body be corrected to “Corpo Servi Dei Leonis Bembo”.With that in mind, it is important to emphasize that Pope Urban VIII in 1634 banned the veneration of those blessed who did not enjoy that title at least 100 years before his decree. Until Pope Alexander III (+1181), the proclamation of the blessed and saints, which was the same at the time, was in the jurisdiction of the local bishop who did so with his own statement, permission to install paintings, the placement of the relics in the altar, or by sending notices to others about the veneration of a saint. After the aforementioned decree of the Pope, the judgement of someone’s saintliness belonged to the Holy See. Leon Bembo was, therefore, proclaimed blessed, that is a saint, according to the first method because he was solemnly celebrated already since 1321, since the installation of the sarcophagus lid. There is also another painting from the 16th century by Lazzaro Bastiani (+1543) with the same motifs from the painting of 1321 and is considered to be a copy. Franconellis Catherina the blind / prayed to the saint and immediately gained her eyesight / In the year of Our Lord 1210. The stars showed the grave of St. Leon / the infirmed rushed, prayed and returned healthy / In the year of Our Lord 1207. The many years of incorruptibility of your body laying in the ground / shows us, Leon, your eternal saintliness. The year of Our Lord 1207. Due to the desperate state of health of my daughter I come to the saint / mother and daughter prayed for their health. In the year of Our Lord 1321. Saint Leon bishop from the distinguished family Bembo/ performed many miracles alive and dead. There is also another version of his life, which states that he was a priest and chaplain at the Court of the Doge. Supposedly, after travelling with the Doge to Syria, he was asked to return there as a Venetian ambassador where the news of his saintliness had spread. When the archbishop in Modona on the Peloponnese peninsula died, a delegation came and begged him to come to them as their archbishop. After four years, heretics wounded him and left him by the road. 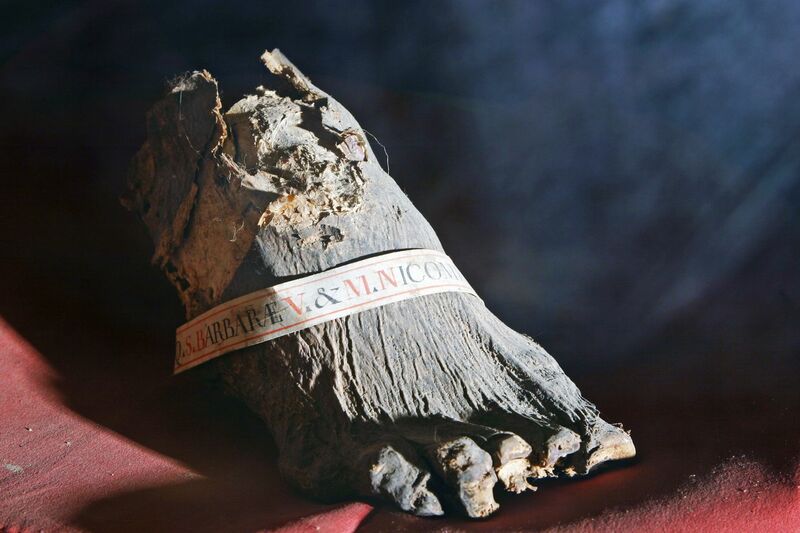 On his return to Venice, his household, the noblemen Bembo, did not recognize him and he continued to live in solitude in the Benedictine monastery on the island of Saint Servolo near Venice, where he was found dead in 1188. At the showing of the miraculous light, his body was found incorrupted. It was not possible to allow such a mass of people onto the small island so his body was transferred to Venice to the church of Saint Lawrence. When the body was laid in the church, all the sick surrounding it were cured, and the blind girl Catarina Franconellis gained her sight in 1210. He was especially invoked for the intercession of couples in cases of marital infertility. At a CT scan in Split on 28 November 2009, it was established that he was partially corrupted. His feast day is on 11 September. Saint Paul was an exceptional example of faith which he strengthened together with St. Athanasius during unrest in the 4th century. Paul was born in Thessalonica at the end of the IIIrd century. He participated in the Council of Nicaea in 325 as the clerk of the Alexander Bishop of Constantinople and renowned speaker against heresy. After the Council, battles with Arians became even fiercer. Emperor Constantine the Great sided with the heretics and persecuted the Christians. Paul, a priest at the time, defended the Christian with all his might and in 336 was exiled to Pont. He returned in 338, with many other exiles. In 340 Alexander, the Archbishop of Constantinople died and Paul was elected Patriarch. Bishop Eusebius from Nicomedia, who did not live an exemplary life, wanted the Patriarchal seat by all costs, thus undertaking all sorts of things against Paul. The Emperor exiled Paul and set Eusebius as Patriarch. After the death of Eusebius in 341 Paul returned. The Arians opposed him and selected Macedonius. Battles erupted in the city. The Emperor residing in Antioch, sent the cavalry commander Hermogenes to exile Paul. The people rebelled against the Emperor’s decision, arrested Hermogenes, and dragged him around the city tied by the foot. The Emperor exiled Paul again but after some time he shortly returned. He was exiled a fourth time. This time the Emperor sent Phillip who, afraid of a rebellion of the people, used cunning. Inviting him into the public baths Zeuksip, with all honours, he called Paul to him supposedly to give him important information. Sensing deceit, many people gathered there. The judge Phillip brought Paul through the inside doors and lowered him into a ship. He let him go to Thessalonica and to visit Dalmatian towns, but he prohibited him from appearing in the East. The Emperor then went to the church were unexpectedly Macedonius appeared, supposedly celebrating his victory. The Catholics and Arians hurried to the church, to see who would take it over first. Soldiers could not enter the church because of the crowd, so they killed 3,150 men with swords, and regardless of the horror, Macedonius was enthroned as bishop. The heretics placed all the blame for the bloodshed on Paul. From Thessalonica he arrived in Rome to Pope Julius where he is together with Athanasius. The Pope recognizes his innocence, but could do nothing about Emperor Constantine. The Byzantine Emperor sent the bishops Narcisa from Gerapoli, Theodore from Heraclea and Mark from Arethusa to convince the Emperor in the West about the correctness of his actions. As justification, in 347 he convened the Council in the Illyrian town Sardica with the heretic bishops, where the Arian bishops did not want to participate. They justified the overthrown Catholic bishops Anastasius, Paul, Marcellus and Asclepas, even excommunicating from the Church Pope Julius. Constantius, blinded by the Arians, threatened Emperor Constantine with war who permitted a return of the deposed bishops. Constantine caved, shortly Macedonius agreed and permitted the return of Paul. In a private church he performed services. Paul remained in the city for two years. And in 350, when Emperor Constantius was killed in Gaul, the heretics again wanted to exile the returned bishops. Among them was also Paul. At their request he was sentenced to permanent exile and taken to Cucusus in Armenia. Saint Athanasius about him states that “in my life he knew nothing but suffering and persecution”. This time he was exiled to the Taurian wilderness in Cappadocia, they locked him in an underground jail, tortured with hunger and thirst. Finding him alive even after six days, the heretics attacked and choked him. To ensure a minimum revolt, they spread rumours that he had died of disease. The governor of the province, known for his cruelty, Philagrius, lamented that others had killed him and not he himself. The historian Rorhbacher from the records of Socrates, Sozomen and Photios, writes: “The First Council of Constantinople ended very ceremoniously with the transfer of the relics of St. Paul, Patriarch of Constantinople and martyr. Emperor Theodosius, discovering about his life and death, ordered that his remains be brought from Ancyra, where they had been taken from Cucusus, to Constantinople in 381. 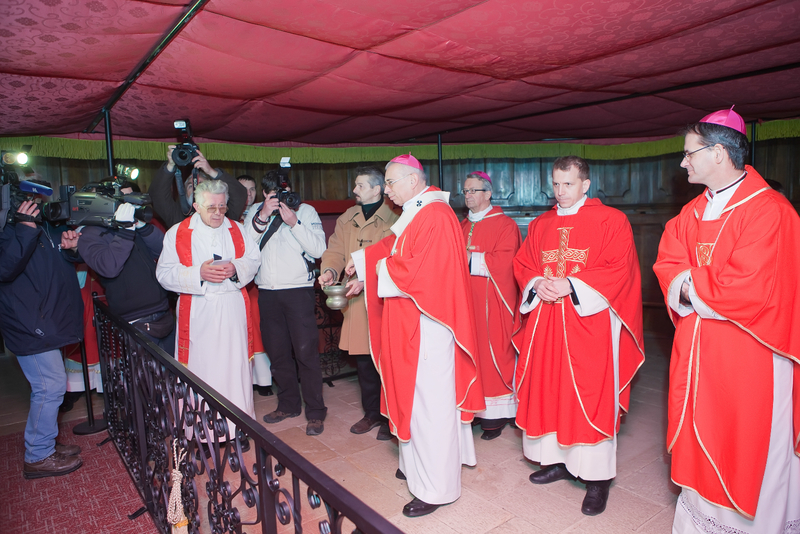 Bishop Nektarij and all the bishops present in the town went to greet his body much further than Calcedonia and greeted him singing the psalms. 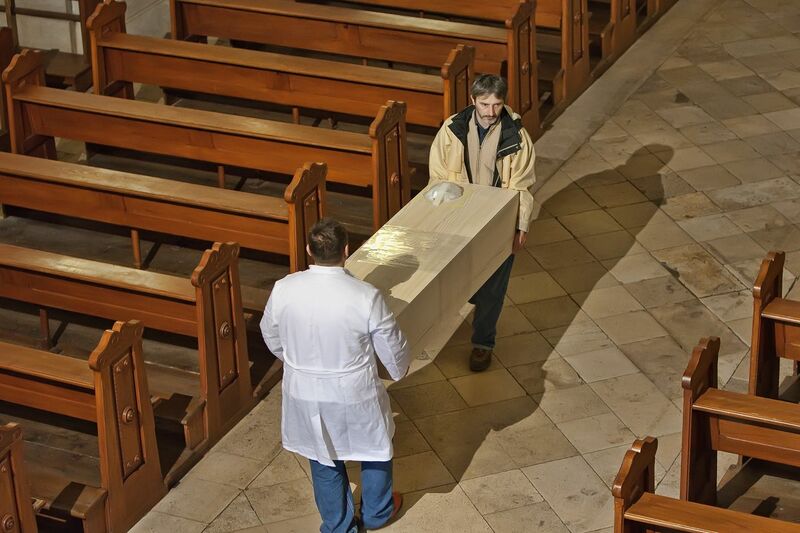 Ceremoniously carrying him into the town, they laid him in the Church of Peace where the saint once held Holy Mass. The next day, in the most ceremonious way they buried his body in the presence of the bishops, priests, many people and Emperor Theodosius in the church called St. Paul’s in his honour. When his body was transferred from Constantinople to Venice is not known. Flaminio Corner in the book “History of churches and monasteries of Venice and Torcella”, printed in Venice in 1758, mentions that his body and those of other relics of the Eastern saints are in the Church of St. Lawrence and that probably part of these relics were those which Emperor Alexios I Komnenos at the end of the XIth century gifted to Venice as a sign of gratitude for the aid given in the fight against the Normans. 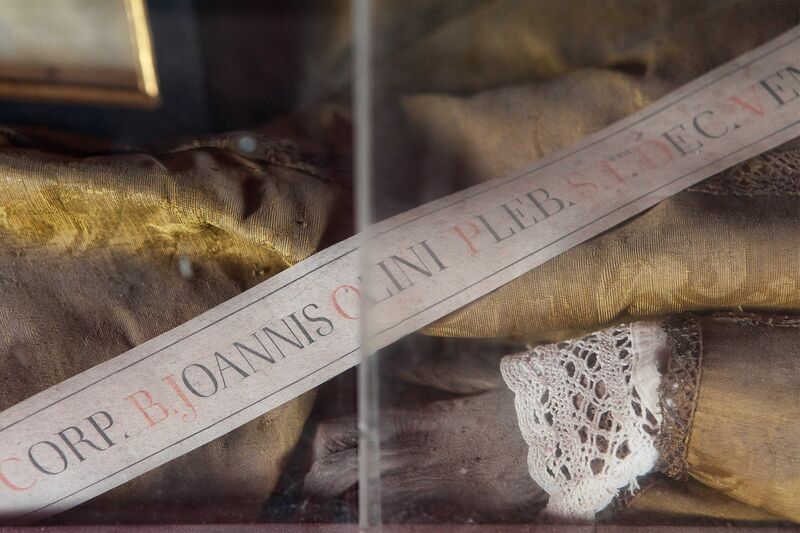 The relics were kept in the Church of St. Lawrence because next to the church was the renowned Benedictine monastery in which the daughters of the most well known noble family lived. And the body of St. Paul had been placed under the altar slab. Probably, after the death of the sisters due to infectious diseases, the body was forgotten. 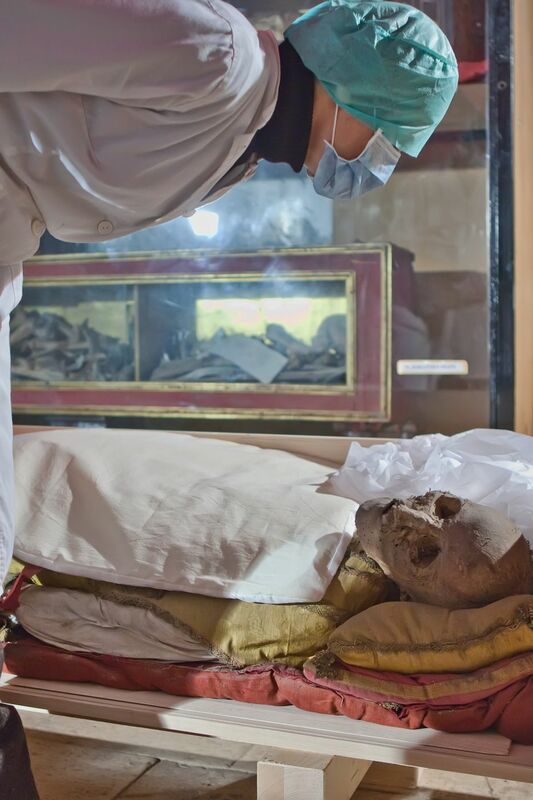 However in the time of the abbess Elizabeta Molin, when dismantling the old altar of St. Lawrence, on 1 May 1493, a marble sarcophagus was found, with a body dressed in bishop’s robes but it wasn’t known whose he belonged to. The patriarch Tomaso Donato was notified and put the vicar Giacomo in charge. In one old Missal, the sisters found a note: “On the altar facing outside near the window lies the body of St. Paul bishop and martyr”. Later biographies were also found, in the Missal his own mass with the feast day on 7 July. Along with the Patriarch, the ceremonious transfer was also attended by six bishops: Concodi, Torcella, Patriarch Aquilea, Zante, Chiogge, Candie and Tira, each with the cathedral chapter, and all those competent in Venice, except for the Doge, absent due to illness. The Feast day of St. Paul in the beginning on 6 November, on the date of the martyr’s death, later on 7 July, on the date of transfer of the body from Constantinople. In Venice he was greatly venerated, particularly by nursing mothers who prayed for his intercession and adorned his grave with votive gifts.